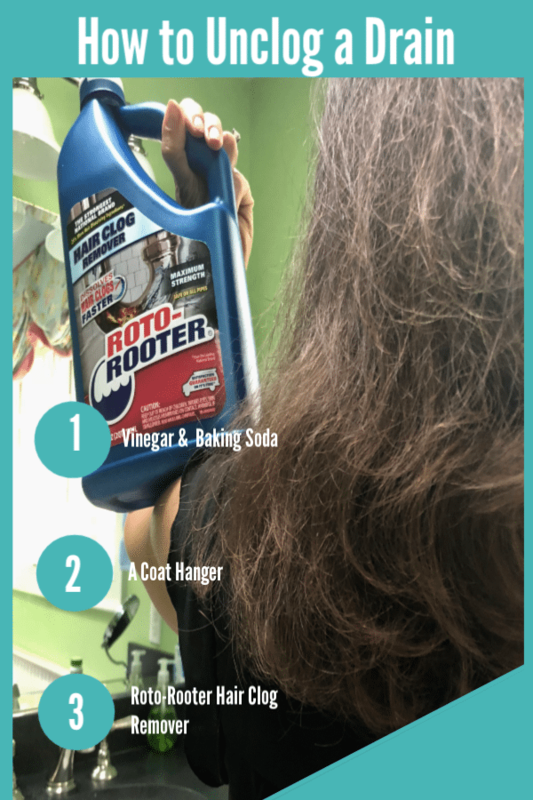 Thanks to CR Brands for sponsoring this post about Simple Ways to Unclog Drains Filled with Hair. There are two women in our home that have long hair. If we each lose the typical 100 strands of hair a day, where are they going? Most of these strands of loose hair fall when washing your hair. Over time your drains can get clogged and no longer do their job. Here are simple ways to unclog drains filled with hair. Even with short hair, your drains can get clogged. So before heading to the store try some these techniques to unclog a drain? This is probably the simplest way to unclog a bathtub or shower drain. Simply boil water and slowly pour it down the drain. With any luck, you won’t need any additional supplies or steps and you’ll have a clear drain once again. Go grab a WIRE coat hanger from your closet. Shape one end into a small hook (using your hands or a pair of pliers if necessary). Fish it down into the shower drain to grab the built-up hair and draw it out. Depending on how long it has been since you last did this, you may want to remove the drain itself (unscrew it) so that you can more easily get your coat hanger hook all the way down to unclog the shower drain. We do this all the time and you will be surprised what you catch! You can do this two different ways but they will both require equal parts of baking soda and vinegar or salt (1/2 cup each). The first method is to mix the baking soda and vinegar before pouring it down the drain. You will notice a chemical reaction taking place by a bubbling or fizzing when the two substances mix together. If you prefer, you can pour the baking soda down the drain first followed by the vinegar (or salt followed by boiling water). The mixture is a great way to remove the tough grime, grease, and hair that has built up. Allow the mixture to sit for about 5 minutes in the drain then rinse it with boiling water. This worked wonders when my shower was not draining properly and I could not get down the drain with a hanger. 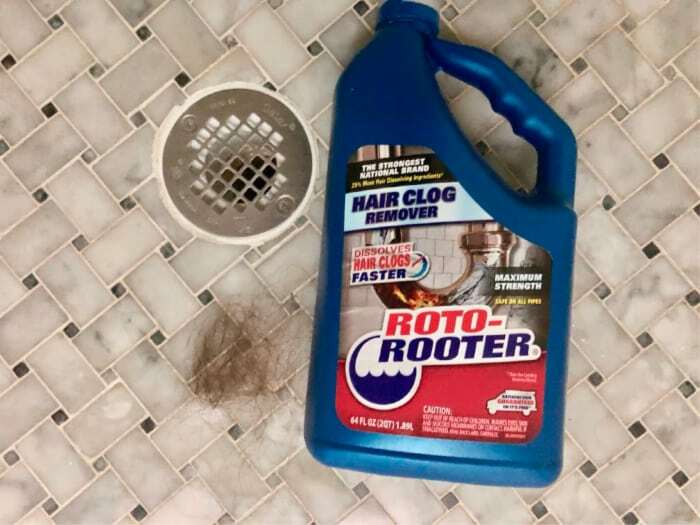 When you have tried the natural remedies and the drain is still not working properly, its time to buy some Roto-Rooter Hair Clog remover and use it per the directions. 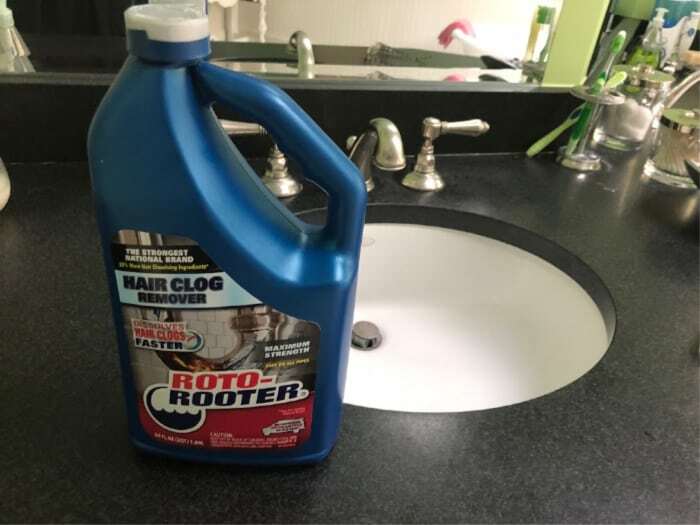 Roto-Rooter Hair Clog’s formula has 25% more hair dissolving ingredients than the leading national brand, removes stubborn hair clogs and clears blocked drains fast. In fact, independent lab studies have proven that tough clogs are cleared faster than other national brands.